You can play Durian Dynamite slot from Quickspin for free now. Try to get at least a couple of bonuses, to feel hope this slot plays. It’s a good idea to test in a demo mode as there some mixed review of this slot. Durian dynamite is a typical 5 reel slot, with an interesting free spins feature where you can get some exploding wilds and feel your screen with wild symbols. There are 20 lines so you can catch up to 20 wild lines. You can play Durian Dynamite for free and try to win big on it. You aim to catch wild lines or to paying symbols during the bonus game. The top paying symbol is watermelon. To start your bonus free spins, you need to catch special bonus jar symbols. 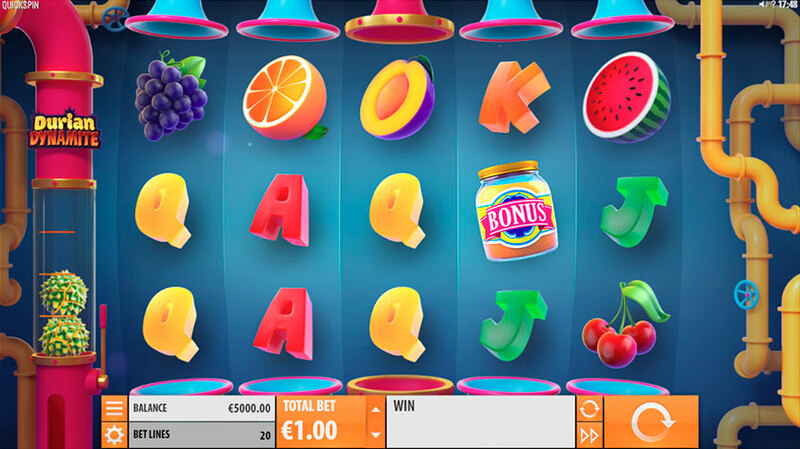 When you land three jars on reel 2, 3 and 4, you start your bonus spins, where you build your own free spin feature. There are three possible power-ups to get: extra spins, dynamite supply for extra wilds and dynamite reels to improve your chance to get extra dynamite wilds. Durian Dynamite slot looks interesting and appealing. You can win 2515x, that’s quite promising, so we can suggest you play this Quickspin and if you have doubts then try to play it free.